This book is as good as everybody is saying it is, and everybody is saying it’s the best thing Marvel is putting out. I’m a ‘Daredevil’ fan, a Mark Waid fan, and a Paolo Rivera fan, so none of this comes as any surprise. Still, I keep flipping through this issue and smiling anew. Matt Murdock is more fun than he’s been in years, and even the pacing feels like it’s from another era. The issue packs in a classic fight-and-talk between Matt and Steve Rogers-as-Cap, plot-advancing criminal investigation by Matt in detective mode (notable among other things for the matter-of-fact presentation of an out gay attorney and his domestic partner), and a trippy-looking supervillain. Foggy Nelson even gets a few pages to flirt with a cute D.A. Decompression, what decompression? I have to admit, though, my favorite thing in this issue was the inclusion of a classic letter page. The Silver Age fan who wrote in to say that, “There is no reason why radiation couldn’t magnify a blind person’s senses’ may be my new favorite person. Thanks, comics! Mark Waid & Paolo Rivera keep up the pace from the first issue, opening with yet another inventive fight scene. Daredevil, still not wanting to deal with the past finds that past definitely wants to deal with him, this time in the form of Captain America. Though I have some qualms with Cap’s characterization here (though this may just be who he is post-Fear Itself, which would be a shame), this is still a fine issue. The reveal of the arc’s villain in the final few pages is surprising, but welcome, showing us that this is no longer the street-level DD we’ve been stuck with for the past decade. Yes. YES. Please, start reading this title if you aren’t already. 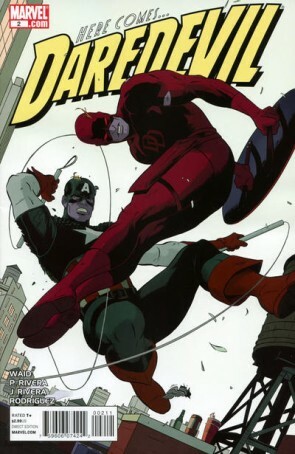 This new Daredevil run has a fun vibe that I haven’t seen since Thor The Mighty Avenger. It’s light and adventuresome without being simple or silly. I really, really wish more superhero comics were like this. The tone of the story and the vibrant, stylish art work so well together. And the take on Daredevil’s radar is cool, especially when put together with the creatures that he stumbles across late in the issue. Those things alone have me looking forward to the next issue. Can’t wait!